Well, maybe Perfection is a bit strong. But I have to say, if I happened across a Lagoon 380 that needed a good home, I'd certainly be happy to adopt it! We were able to board a 2008 (?) Lagoon 380 this past Thursday - here in Savannah, of all places. She was great! Lots of room, clean lines, not a lot of clutter - but plenty of amenities, and certainly liveaboardable/charterable (yes, I make up words. You'll get used to it, even if SpellCheck never does). We happened to be on the Owner's version (my favorite) but I'm sure the Charter layout would work as well. If you're unfamiliar with Owner vs Charter - well, we were too until we started all this catamaran shopping. The Charter version has 4 berths (bedrooms) - one in each end of both hulls. And a head (bathroom...) between the two berths, to be shared. So - 4 bedroom, 2 bath in traditional real estate lingo. The Owner's layout, however, has 3 berths and 2 heads. 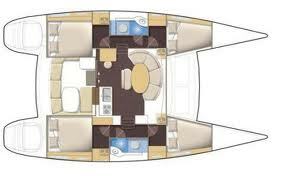 One hull has an identical layout to the Charter version, but the other hull has a larger berth on one end and a much larger head at the other - with some sort of desk/dressing table/couch etc in the middle. 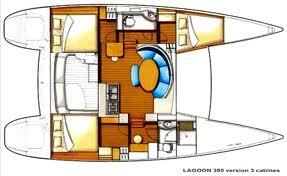 I'll post a layout from a Lagoon 380 so you can see what I'm talking about. So where does this leave us? To be honest, Lagoon 380's in the Owner's layout are actually fairly hard to find. And pretty pricey. Our price range keeps going up and up and up... Time to figure out how to juggle our real estate in order to land on a solid $$ amount - a realistic $$ amount, so that we can REALLY get in there and start shopping! All in due time, I'm sure. But I have to say, being on that Lagoon last week certainly made me itch to get out on the water!